We know how important your vacuum is to you, which is why North Shore Vacuum and Appliance offers timely vacuum repairs Beverly MA residents can rely on. Between our fully stocked shop and expert technicians, we will have your machine fixed in no time. Our staff has the experience and tools needed to work with all major brands so that whatever make and model you have, and whatever vacuum repairs are needed, we will be sure to get it done in the time you need. North Shore Vacuum and Appliance has a long history of providing expert vacuum repairs to residential and commercial clients throughout the greater Beverly area. 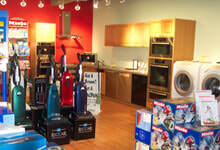 We take pride in our reputation for knowledgeable vacuum repairs Beverly MA. Area residents in need of repairs should contact us today for more information, by calling (978) 774-1155.